In all the years since Cindy Smith’s mother died, her life has been a succession of flats and hotels. This time, Dad means Cindy to have a settled home while he is away. So he sends Cindy to live with her cousins, Jemima and Agnes (presumably they are generation or two removed from her as they are much older than she is). They are two elderly ladies who are very rich, live in luxury, and have a pony and a dog. They sound like great relations to live with all right. The only snag Dad mentions is that they never took to Cindy’s mother and may have “funny little ways” as they are elderly. As it turns out, that is a forewarning of what is to come. 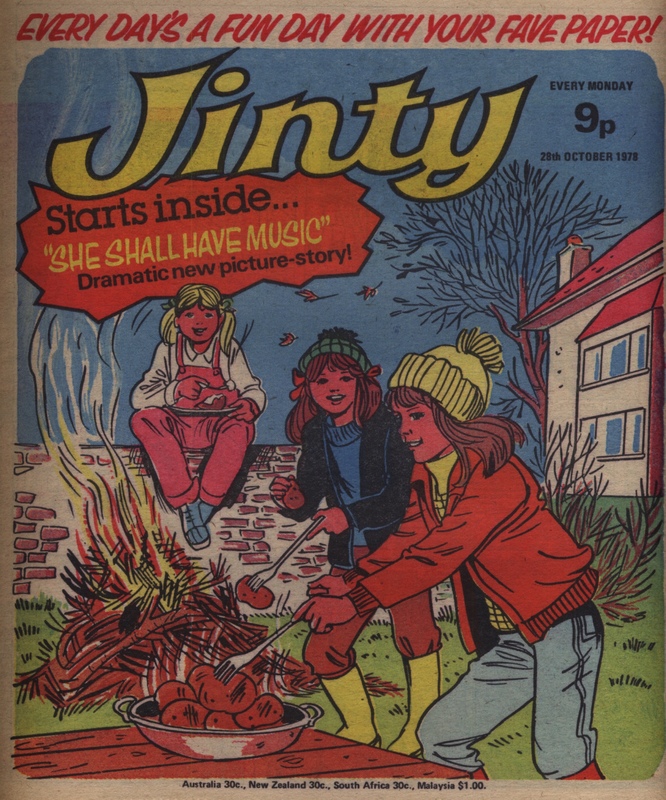 From the moment Agnes and Jemima see Cindy, she gets the impression they are not taking to her either. “Funny little ways” is the most misleading description of their ways too. Although the cousins live in luxury, they force Cindy to sleep in a shabby, miserable attic that has never even been installed with electric fittings as the rest of the house is. They flog all her clothes to make more money and make her wear tatty second hand clothes, which she has to wear to her new school as well. The cousins have the nerve to tell the headmistress that Cindy is wearing those clothes because she is poor! When the school insists on school uniform, Cindy has to go through the humiliation of the school kitting her out in a second hand one. The cousins don’t feed Cindy properly, and they even go as far as to give her leftovers from the dog’s dish. And of course they make her do all the work around the house. Even their spoiled dog Woozums joins the abuse (to begin with). The cousins threaten Cindy with canings to get her into line and they even chain her up while she’s working. When they catch Cindy trying to write to her father they lock her in the attic and torture her until she signs a contract that not only gives them the allowance she receives from her father but also makes her swear to silence about the abuse. Cindy tries to fight them, but she soon finds they are too strong, especially when they wield the cane against her. At first it seems the reason for their mistreatment of Cindy is that they are real tightwads. Plus, they are too lazy to do any work around the house and lumber her with it all. They won’t spare a penny on Cindy (or anything else) if they can help it. The only thing they spend any money on is themselves. They won’t call in professional help for jobs they can make Cindy do for free, such as sweeping the chimney or painting the house. They won’t spend money on professional help for jobs that Cindy can’t do either (watch this space). They sell Cindy’s pendant containing her mother’s picture for the money when they don’t really need the money. All the while they receive money from Cindy’s dad for her upkeep. But of course they don’t use the money for her upkeep. However, Cindy eventually realises the cousins have deeper motives for their cruelty when she discovers they have cut out her mother’s face from her wedding photo. She realises Agnes and Jemima hate her mother for some reason and are projecting that same hatred onto her because she looks like her mother. Cindy never finds out why the cousins hate her mother. School is Cindy’s only respite from the abuse. Cindy finds a new friend Kay, and tells her how her cousins are treating her. At first Kay finds this hard to believe, but she comes to realise it is true and becomes one of Cindy’s helpers against the cousins. So too is Kay’s mother, who gives Cindy a Saturday job to help her raise money and she also senses the abuse Cindy is going through. It is during this job that Cindy learns some innings about the fashion world and dressmaking, both of which foreshadow what is to come later. While working at her Saturday job and other jobs to buy back the pendant, more people grow concerned about Cindy’s welfare, as they notice she looks half starved but never steals any food while working at the market. Then Cindy finds another outlet from the abuse when she is invited to a party, and has to put together an escape plan (crowbar for the window bars the cousins installed, skewers for picking locks, and an escape ladder) to get there. At the party, Kay’s father Mr Bates discovers how photogenic Cindy is after seeing her in the party photos he took, and proposes a modelling contract. The modelling contract requires the cousins to sign their consent as legal guardians, which means a bit of cunning on Cindy’s part. Hence Cindy stuffs them with so much food in order to make them so sluggish that when she flashes the contract under their noses (slipped in among old documents appropriated from the school office), they just sign without reading first. Payback for tricking her into signing away her allowance! So Cindy’s modelling job begins, but Cindy is now lumbered with the burden of having to go about it while keeping it secret from her cruel cousins. Kay and another school friend Susie lend a hand in helping Cindy, such as providing Cindy with suitable interview clothes and helping her go to modelling jobs in disguise. Mr Bates also does his bit to help Cindy along against her cousins. Cindy is further helped by the fact that her modelling image requires her to wear a wig, which helps keep her cousins from recognising her in any of the photos or modelling shows. All the same, Cindy has to take precautions such as disfiguring or destroying photos of herself in magazines before her cousins see them. When the cousins are set to go to a fashion show where Cindy will be modelling, it’s some fast thinking and help from Kay to make sure they don’t recognise her. In order to have a pretext to get to a modelling job, Cindy offers to take Woozums for a walk. This leads to very unexpected consequences that change the face of the story. Up until now Woozums has been as hostile to Cindy as the cousins are. But when Cindy has to bring him to the modelling studio where he ends up sharing the shoot with her, he loves the attention so much that he behaves himself. As it turns out, this is the start of a friendship with Woozums. It cements when Woozums gets sick from rotten biscuits the cousins left out for Cindy to have (trust them!) and she gets treatment for him. From that point on, Woozums becomes a good doggie to Cindy and even makes his own escape so he can accompany Cindy on her new modelling shoot. Unfortunately this causes another close call, and with consequences. The cousins spot Cindy and Woozums’s shoot on television. They don’t see through her disguise, but they do notice the dog looks like Woozums and then they realise he is not around. When Cindy and Woozums return, the cousins are full of hard questions and then hit Cindy. This prompts Woozums to growl at them, at which the cousins deem him a savage dog (or guess his change of heart?) and say they will have him destroyed. Cindy takes Woozums to Mr Bates’ office, and he is only too happy to have Woozums as he is now part of Cindy’s image. Woozums will now have a salary too – but he must earn it of course. Cindy’s new shoot is at a stately home background, which would require the whole day away from the cousins. Mr Bates understands the situation and tricks the cousins into coming to the stately home on a line that they are connected with the duke who lives there. Cindy comes as their maid and is free to slip away to her shoot with Woozums. Alas, the trick has an unexpected backfire. The cousins come home so super-snobby that they are determined to all determined to spruce up their home to reflect their high connections. But as usual, they are too mean to pay for getting it professionally done. Instead, they lumber poor Cindy with painting the whole house from top to bottom, and it’s all being paid for with the money they have cheated out of her. This enormous, gruelling job has all the girls at school now realising just how badly the cousins treat her. Cindy is so exhausted from it that when she and Woozums set off for their new shoot she falls asleep on the train. While Cindy is out, the cousins’ miserliness explodes right in their faces. They have been too stingy to get the house rewired (and from the sound of it, the wiring hasn’t been looked at since grandfather’s time!). So, during the night the ancient and neglected wiring finally crumbles and starts a fire. The cousins escape, but the house burns to the ground. And guess what? The old skinflints had been too mean to get insurance! As a result they lose everything and are reduced to sleeping in their own barn. Now it’s their turn to sleep in miserable accommodation. When Cindy comes back, she is surprised to find her cousins being chased by a lynch mob because everyone thinks they deliberately left her to die. That part is soon sorted out. Still, the whole story of their mistreatment of Cindy is splashed all over the papers, so now they are publicly disgraced as well as ruined and homeless. Cindy decides not to press charges as she feels prison would be too comfortable for them. She is much happier with the punishment her cousins have brought on themselves. This includes their having to work for a change – which is slogging in Cindy’s school canteen. Cindy gets her father’s allowance back in addition to her salary and is staying with Kay until her father returns. There is an extra reward for Kay – she is coming on Cindy’s new shoot in the south of France. At 24 episodes this is no doubt Jinty’s longest running Cinderella story. It makes no qualms about its parallels to Cinderella either. “Cinderella” is in the title itself, and the cousins are the archetypal wicked stepsisters: one is tall and thin, the other is shorter and fatter, and both are caricatures of ugliness, which is how the wicked stepsisters are always portrayed in Cinderella pantomimes. There is no wicked stepmother figure. Still, she isn’t needed in this case because the wicked stepsisters, er, cousins, are more than old enough to do it themselves. Agnes and Jemima must rank as two of the most extreme and sadistic of wicked stepsister figures in Cinderella serials. To the best of our knowledge, even Cinderella herself was not put in chains, subjected to downright torture or being forced to eat from the dog’s dish. But this is what happens to Cindy. They are not merely out to wring cheap labour out of Cindy and take advantage of her to save on more pennies. They are also deliberately inflicting physical and psychological torture designed to break Cindy down completely, and it stems from their hatred of Cindy’s mother. The reason they hate the mother is never explained. The way they defaced the photograph suggests they were jealous of the mother’s good looks. This would tie in with the Cinderella theme, but it cannot be said for certain that this was the reason for their hatred. Cindy wonders if the answer to the mystery lies in the house somewhere. But she never gets to investigate it further. 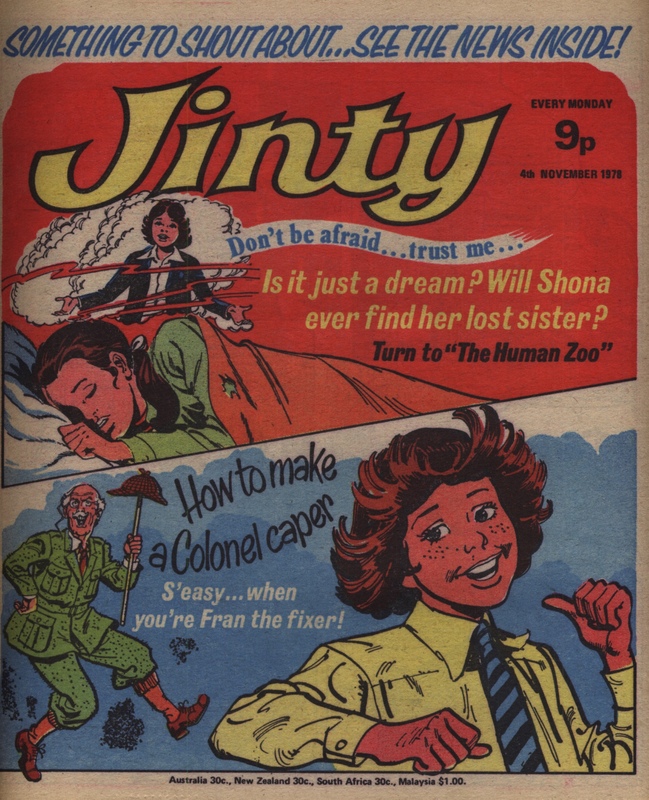 Jinty must have either forgotten to follow it up or dropped the ball on it for some reason. Either way, this particular loose end is left dangling, which is annoying. It would have given more depth to the psychology of the cousins if we had learned the reason they hate Cindy’s mother and just what they are projecting onto the daughter. Is it jealousy? Is it disapproval of the marriage? Or is it something else entirely? Even without their hatred of the mother, their stinginess and selfishness alone would have driven them to mistreat Cindy and wring every penny they can out of her. 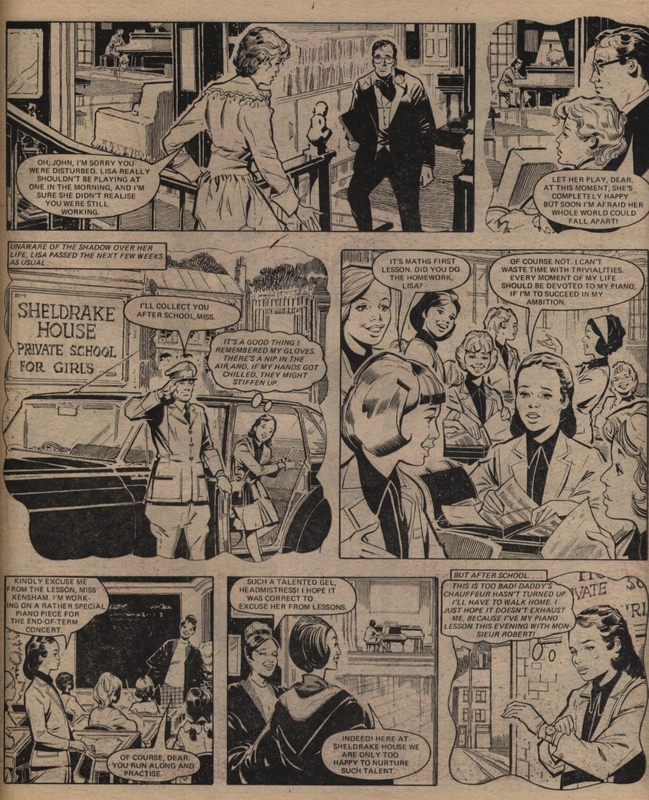 A lot of misers in girls’ comics are played to satirise stinginess such as “Jeanie and Her Uncle Meanie”. However, these two misers are definitely not played for laughs. In fact, their miserliness goes not only to callous levels but dangerous ones as well, such as leaving the house wiring neglected and in danger of starting a fire. They must get their stinginess from grandfather. In the first episode they said he never bothered to get the attic level wired, saying young children made it dangerous to have light up there (yeah, riiight). After their downfall, there is no sign of them expressing any remorse. Nor does the story go into whether or not they were shocked into changing their stingy ways. We only see them grumbling at the humiliation of slaving in the school canteen, right in front of the girl they used to mistreat. Only the artwork from Trini Tinturé serves to add some dilution to the cousins’ villainy by giving them a somewhat caricatured look. In the hands of a more serious, straight artists they could have been really terrifying. The story does take quite a while to find the outlet of the modelling job, which occurs around the middle of the story. Up until then it’s futile attempts to fight the cousins, finding ways to break free of the attic and shackles, and doing the odd jobs to raise the money to buy back the pendant before it’s sold. So the earlier episodes may be construed as lacking a bit of focus, while the later episodes go in a clear plot direction once Cindy becomes a secret model. On the other hand, the early episodes could be intended as groundwork for the plot, what with Cindy finding ways to get away from her cousins, make friends to help her against the cousins, and the early job of working in fashion and dressmaking, which is an ideal and foreshadowing lead-in to the modelling job. It’s the perfect foundation on which to build her secret life as a model against all the cousins’ abuse. The turnaround of the dog Woozums is well handled and believable. Being included in the shoot appeals to his selfish nature and gets him lots of attention. So he’d only be too happy to come back for more and behave himself, if only for that. Gratitude for Cindy saving his life changing him for the better is also credible, even if we do have to wonder why Woozums didn’t smell out that the biscuit was rotten. Woozums still causes the odd problem, but these stem more from his doggie nature than his former attitude towards Cindy. One example is where he digs up the earnings Cindy hid in the garden before she could bank them, so the cousins spend all the money. On the whole, though, he becomes wonderful companion for Cindy on her modelling jobs. Where he truly redeems himself is where he growls at his mistresses for abusing Cindy. He has gone from being a fellow abuser to helping Cindy stand up against the cousins’ abuse. For his pains, the cousins turn against their own pet and having him put down as a “savage” dog. This is one of the moments where the cousins show just how spiteful they are, for it looks suspiciously like the real reason they are putting him down is because they sense he has gone over to Cindy’s side. In the end of course, Woozums is rewarded with a much nicer owner, his own career, and even his own salary. This would be the final and fitting punishment for the cousins. While they have been ruined, made homeless and forced to sleep in substandard conditions, and slaving away at menial jobs that wouldn’t pay much, the girl and dog they abused are now rich and famous with high-paying salaries. And they brought it all in themselves through their own miserliness, cruelty and spite. Lisa Carstairs is a talented pianist and a selfish, self-obsessed girl who cares nothing for anyone or anything except her piano. We see a glimpse of her life as a rich girl who can spend as much time as she wants just practicing her piano, waited on by maids and fawned on at school. Her father works hard at keeping his business together but to no avail: it comes to an end with a crash, when his business partner flees the country and leaves Mr Carstairs with the associated debts. Everything has to be sold to pay for it, including Lisa’s beloved piano – and her sympathy is kept all for her own losses, with none left for her parents’ difficulties. For much of the rest of the story, all Lisa can think of is how to get access to a piano, preferably her own. She goes to the auction house and threatens to have the law on anyone who touches ‘her’ piano or dares to buy it, but of course she is onto a loser there. The family move into a little terraced house and she is sent to the local school rather than her posh private school. Her posh private school, for all their glib words about admiring her talent, want nothing to do with ‘the daughter of a bankrupt’ so there is no chance of playing their piano! There is a piano at the new school but she has already set everyone against her there by failing to listen to anyone, failing to adapt to her changed circumstances, and failing to understand that people aren’t going to fawn over her talent any more. She only barely gets to play the school piano, which she is only allowed to do once she has apologized to a teacher that she was rude to (and even then she gives one of those rubbish ‘I’m sorry if you were offended’ type apologies – actually she says ‘The Head wishes me to apologise to you’ which should have been something they would have seen through but still). Playing the school piano isn’t enough, mostly because she is not treated with the amount of adulation she still expects (without in any way having earned it of course). The assembly music she’s given to play is not what she wants to play, so she summarily sweeps it aside in favour of some technically challenging classical music – not surprisingly this approach fails to go down well. The kids are unimpressed, Lisa is angry at them for not fawning over her (er, I mean appreciating her obvious talent when she condescends to play for them), and she calls them loud-mouthed, ignorant and stupid. So it’s war between Lisa and the whole school from now on. Well, not quite the whole school. Tracey is a girl who likes classical music and has some sympathy for Lisa. She stands up for her even when everyone else is sick of the sight of her. Including the Carstairs parents, probably: Lisa was nearly starting to be sympathetic to their difficulties when she heard them say they’d try to make it up to her by getting a replacement musical instrument. She immediately imagines a beautiful piano taking up most of the space in their shabby small terrace – but of course all they are able to buy is a tiny electric chord organ, which from Lisa’s point of view is nothing better than a toy. Not that anything excuses her reaction, which is to kick it to pieces in a tantrum! Another try at getting access to a piano is when she finds out that her piano was sold to the Mayor, for his spoiled daughter to plink-plonk on. Rosalind, the mayor’s daughter, takes the opportunity to bully Lisa by playing on her desperation: she has Lisa steal and beg for a chance to play. It doesn’t take Lisa that long to realise that Rosalind has no intention of actually helping, but it does take a little longer before she can bring herself to swallow her longing and walk away from her old piano. Lisa’s quest for a piano to play nearly breaks up the family when she finds that a piano showroom is advertising for a cleaner. Lisa herself is too young to take the job but she cajoles her mother into it, despite her father’s opposition – he was made redundant just previous to that point, and his pride is injured at the idea of his wife working to bring the money in. It works well for a time, and Lisa even shows some signs of empathy – when her father strides into the house announcing he is going away, she thinks it is because of her doing, and she realises she would much rather have her father around than access to a piano to play. It turns out not to be as bad as she had feared – Mr Carstairs is not leaving his wife because of the argument about her working, phew! In fact he has been offered another job, but it is far away and he will have to travel there and be located elsewhere. 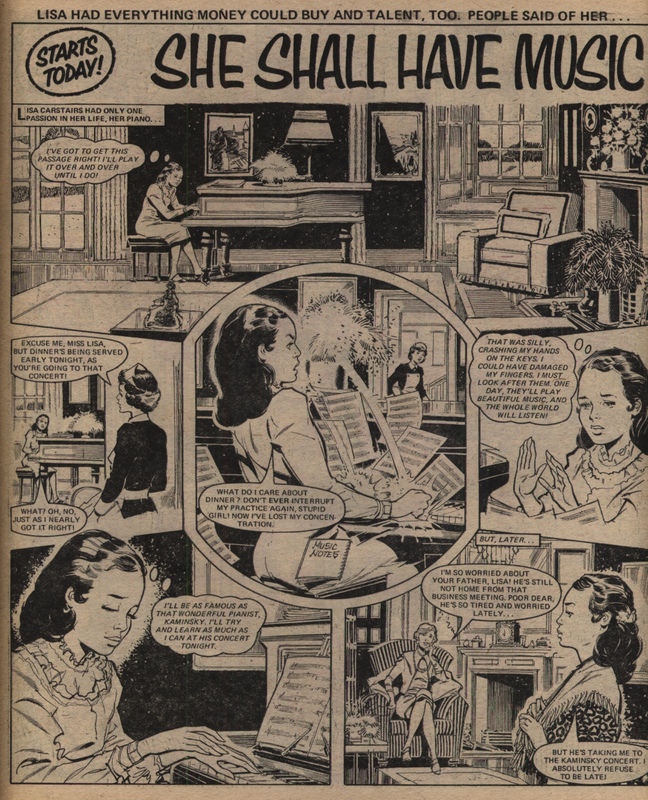 Mrs Carstairs is relieved to think that she can give up the cleaning job, but an also-relieved Lisa is a newly-selfish Lisa, who pressures her mother to continue with the job for the sake of her music. It turns out to be the final straw of stress on Mrs Carstairs though – she collapses, and it is revealed she has been in pain for a long time previously without mentioning it. Lisa needs to go and stay with her one school friend, Tracey, in her busy house: and of course the ungrateful Lisa only thinks of the bad side, in particular the fact she has to do chores which she fears could damage her artistic hands. To top it all, Mr Carstairs is not able to come to be at his wife’s hospital bedside – because he has vanished! It seems he never appeared at the new job workplace at all. 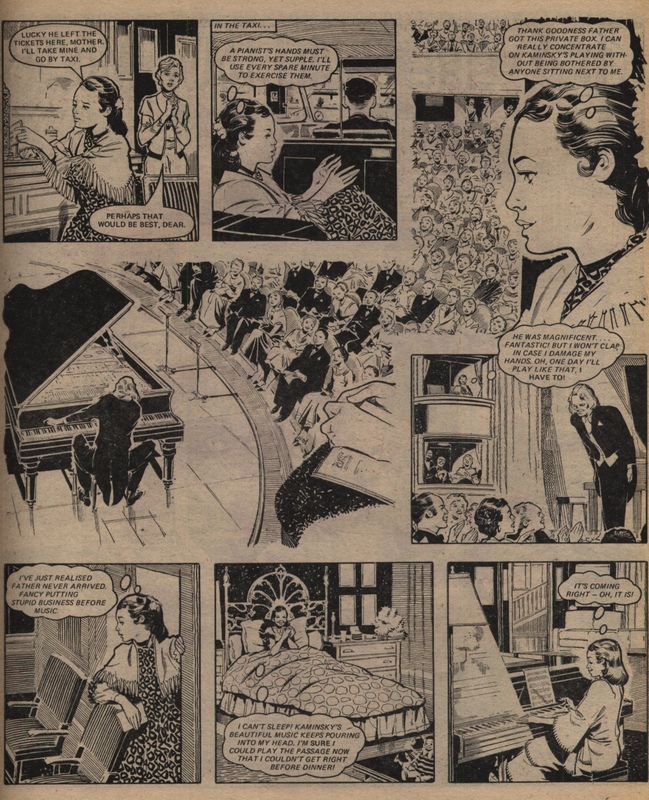 This final, very nasty, surprise is the making of the girl – she is quiet and not boastful in her new location, and she doesn’t go all out to find a piano to play, as she had before. She spends her time helping with the younger children and mucking in, even roughening her hands or running the risk of injury if it seems like a worthwhile activity needs her help. And when finally she does play the piano again, after a long time of refusing to even try, it is only at the earnest request of a little boy she is helping to entertain – she is doing it for his sake, not her own. The reward comes at last – her parents return, both together – Mr Carstairs has been found! He had been injured and had lost his memory and his luggage, so his identity took a long time to be established. And Lisa has come to realise that the most important thing for her right now is to be together, as a family – and that is more important even than music for her. 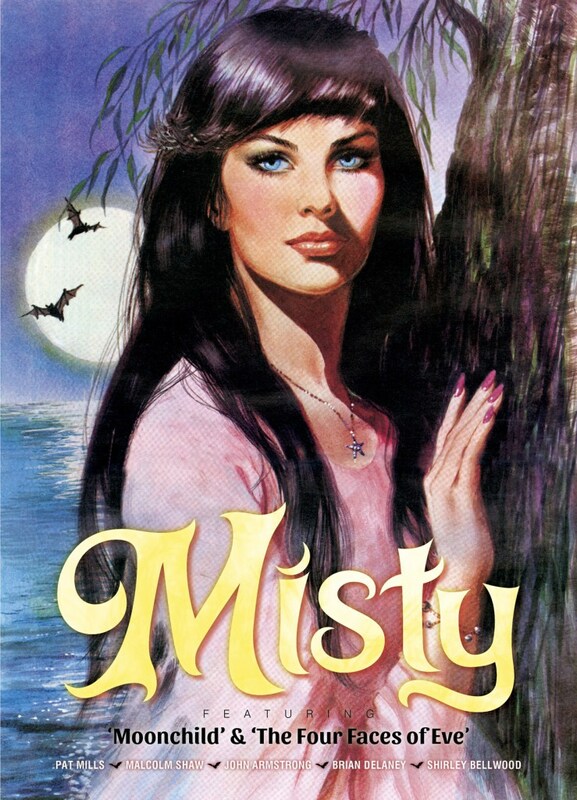 Lisa Carstairs is one of the more unpleasant, selfish, hard-hearted protagonists that there is in Jinty. She’s not outright evil, as is the case with Stacey in “The Slave of Form 3B“, but because she is such a hard case it takes a long road, and a lot of knocks, to redeem her. You might think that the opening episode, where she loses her family home and all their worldly wealth, would be enough to do it, but in girls comics there is definitely further to fall. In her case, she needs to plumb the absolute depths before she can come back up again – and here that means losing her whole family, and knowing it is her own fault and no-one else’s. In other stories the sense of guilt can be an illusion built up in the protagonist’s mind – for instance in the case of Ann Ridley in “I’ll Make Up For Mary”, where it drives the whole plot – but here it is not over-done and it is effective as a wake-up call. The passage of time in this story is done quite well. For instance, the last episode (which is 4 pages long) covers the timespan from Lisa’s arrival in the Home to her final happy moments of realization. It isn’t supposed to take place in only a day or two – the text explicitly refers to several weeks having passed. Likewise, earlier on, the passage of time is made rather more visible to the reader than in most stories. This all makes the main driver of the story – Lisa’s redemption – more realistic. 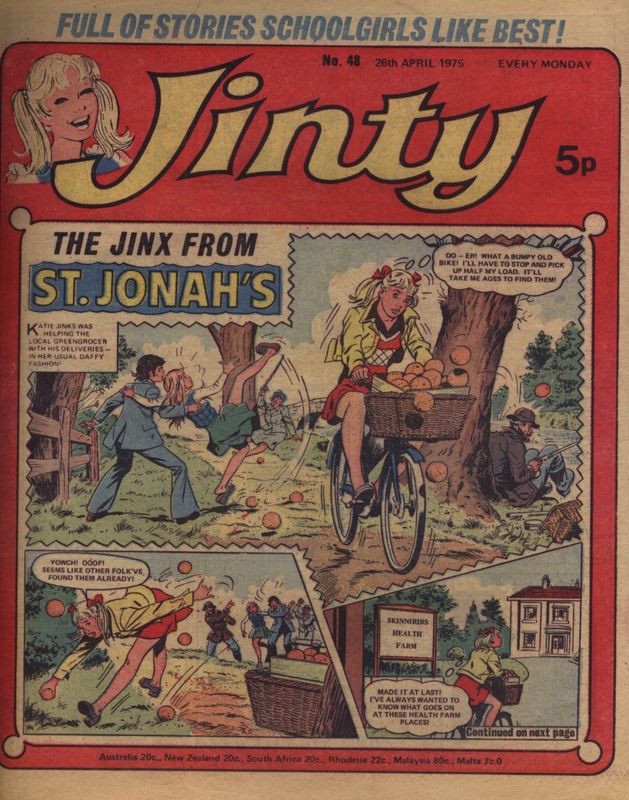 This is Ron Smith‘s second and final story done for Jinty – after around this time he was found doing the bulk of his work for 2000AD, so he is often thought of as primarily an artist for that title, and on Judge Dredd specifically. 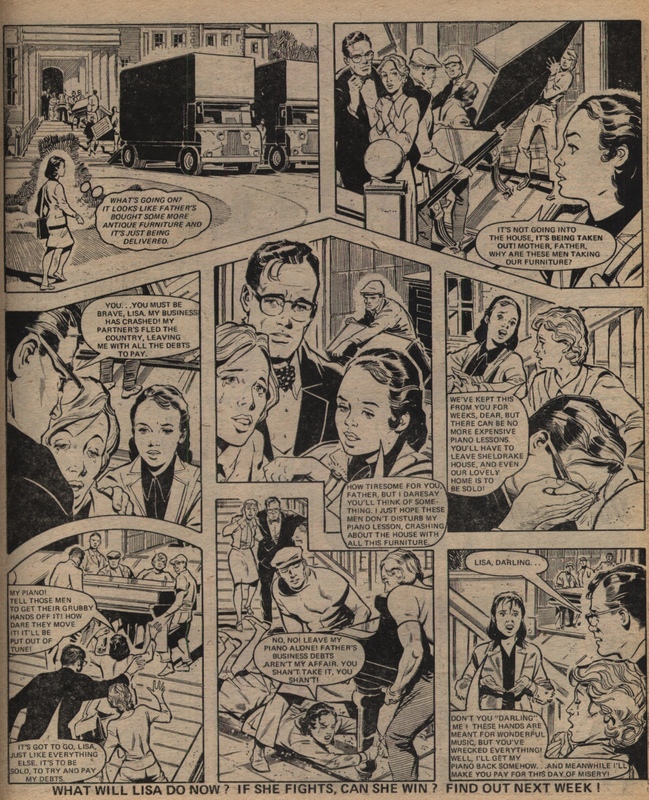 His work on that is indeed fantastic, but it means that it’s easy to overlook the fact he had a long career as a girls comics artist before then, working for DC Thomson’s Bunty and Judy in particular.